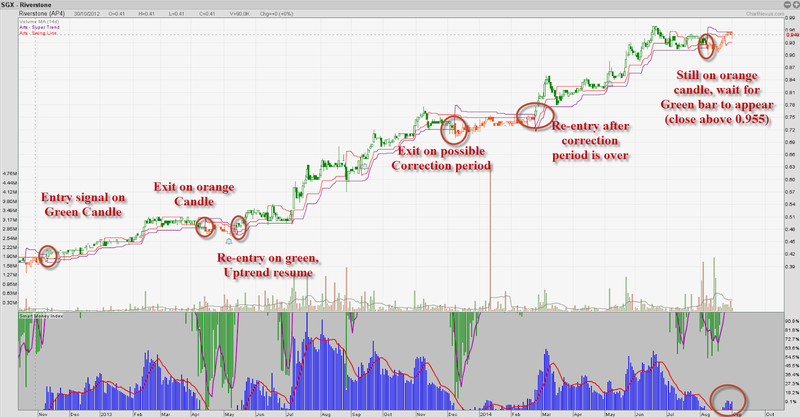 As mention in most of our seminar, we only like to trade Up trending stock that have more smart money in the stock. Riverstone is one of the counter that we have been following the trend. This is one of the best trending stock for the past 2 year, and it is still not dropping. So if market is good, there is more reason for it to go higher. Our strategy is simple, just wait for the price to break and closed above the resistance(purple) line the Green Candle will appear. As long as the price is moving higher the system will not change to orange candle, hence following the trend till it end, helping you to maximize your gain.